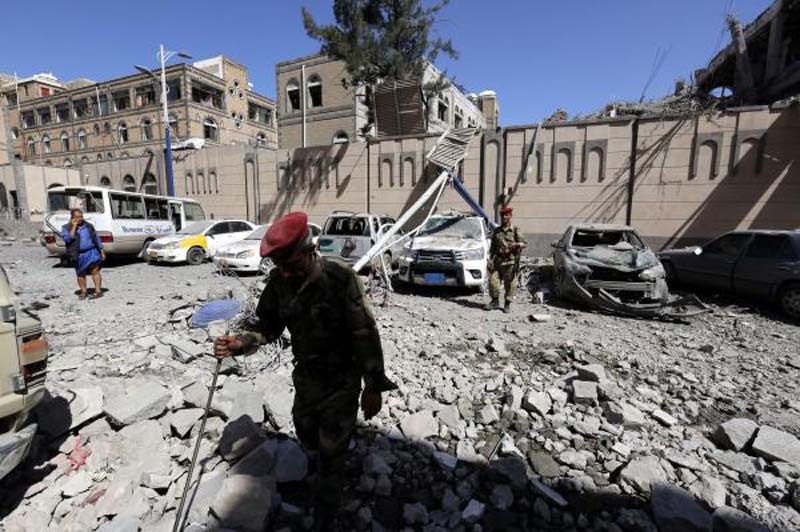 At least 6 people died Monday and 60 were injured when Saudi-led coalition jets bombed the presidential office in Yemen's rebel-held capital of Sanaa, officials said. Yemen's state-run news agency, Saba, said fighters targeted the office used by the Houthi rebel administration, which normally holds a large number of employees. The strikes damaged homes and vehicles and interrupted final exams at the Gamal Abdel Nasser School. Footage of the airstrikes showed thick black smoke and heavy wreckage the streets. The Norwegian Refugee Council said it was "appalled" by the strikes on such a highly-populated district. "Yemeni people are not collateral," the Council said in a statement. "Adherence to the laws of war is not optional. "In recent weeks, Yemeni civilians have been killed in their homes, driving their cars, and at social gatherings. Since the start of the year, over 460 Yemeni people fled their homes every day, many with nowhere safe to go." The Saudi-led coalition began military intervention in Yemen three years ago, with the goal of ending Houthi control and restoring the displaced government to power. Monday's raids came hours after Riyadh said its military intercepted two ballistic missiles launched by Houthi rebels at southern Saudi Arabia Sunday. The United Nations has said the Yemeni civil war is the "world's worst humanitarian crisis" -- with more than 22 million people, or three-quarters of the population, in need of humanitarian aid and protection.